It’s necessary, to a large degree, in order to explain their complex solutions and what they can do for their customers. But for marketers, it can be overwhelming to create loads of high-quality content. Especially when it’s piled on top of an already very long to-do list. You bet. 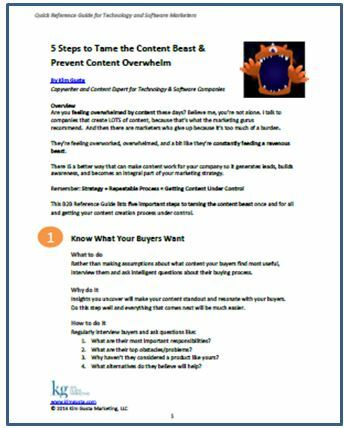 Take a step back, a deep breath, and start with this Quick Reference Guide that describes five steps that can simplify content creation. Some you’ve probably already heard elsewhere, but, the important question is: Are you doing them? Consistently? My goal is this Quick Reference Guide helps you get started taming the content beast so you can really reap the rewards of content marketing without burnout or overwhelm.